Thomson. 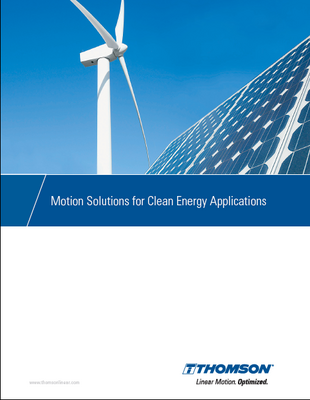 Thomson products suitable for applications in the clean energy industry are rugged and reliable, withstand harsh environments and are protected to IP67. Manufacturers are taking a long, hard look at the way they use motion control systems in their equipment. Once dominated by pneumatic and hydraulic systems, machines are now more often designed to use electric linear actuators for the automation of many tasks. They are easier to control, integrate with control systems and are smaller, lighter and cleaner than hydraulic systems – all attributes that brighten a company’s bottom line. Electric linear actuators or screw jacks eliminate: hydraulic pumps, valves and hoses; cost and bulk associated with hydraulic systems; environmentally hazardous oil and risk of leakage; high energy consumption of hydraulic systems; costly hydraulic reliability issues (contamination); cost and hassle associated with fluid maintenance.